St Andrew's Church, Hexham. Photo Northumberland County Council, 1971. The town of Hexham is located near the confluence of the rivers North and South Tyne. Its location has been strongly influenced by its position on a significant east-west cross country route and close to the easiest crossing point over the river. The site is one where there is a good water supply and the land is suitable for cultivation, so it has been an ideal location for settlement for many centuries. The architecture of the old town is dominated by the Priory Church and, across the Market Place, by the Old Gaol and the Moot Hall. Both groups appear to signify the secular and ecclesiastical interests which sought to control the town and the region. But the archaeology of Hexham starts long before Wilfrid founded his church there. The earliest evidence of human occupation in the area dates to the Neolithic period. A Neolithic carved rock has been found among a number of carved stones of various dates in the Abbey; however its original prehistoric location is no longer known. Two additional stones of the same type and date have also been found at Shield Croft Farm near Gallows Bank, lending weight to the possibility of Neolithic occupation in the area. Two burials dating to the Bronze Age have been discovered near Hexham over the years; one found in 1830 on the Newcastle road and one in 1921 on the Golf Course. This, combined with a Bronze Age axe from the town, suggests a fairly small presence in the area at that time. As we move forward in time, we see less archaeology relating to the Iron Age. Only a coin from an unknown location in Hexham has been found, and this may well have originated from elsewhere. There is far more archaeology dating to Roman times and this has caused some debate amongst archaeologists and local people. Do the many Roman stones, such as the one found near Hallstile Bank and others found built into later buildings, come from a previously unknown Roman site in Hexham? Or were they simply transported from Corbridge where a large Roman military supply base was quarried to use the stone for the Anglo-Saxon church which was subsequently built in Hexham? The debate has led to a flurry of activity, where archaeologists seek to prove their favoured theory. A number of tracks have been identified as possible Roman Roads, but no firm dating evidence has been found. When Beaumont Street was built alongside the Abbey in 1864, two Roman altars were found. In addition, a Roman coin was found when two houses adjacent to the Abbey were demolished in 1841 and a number of Roman stones can be seen within the Abbey today. Is this enough to suggest a Roman site under the abbey? Some archaeologists have sought to prove that the Abbey is the site of a former Roman fort and claim to have found ditches relating to this fort. The debate is likely to continue for many more years. The earliest documentary reference to Hexham occurs in AD674. Land known as Hestaldesham was granted by Queen Ethelrid, or Etheldreda, of Northumberland to Wilfrid to endow a new bishopric. 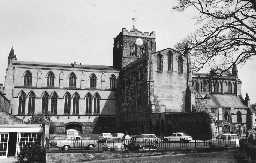 It was during this time that Hexham began to flourish with the founding of the Church of St Andrew by St Wilfrid, the bishop of York. The church was built between AD674 and 678 and became a cathedral in 681. In AD821 the bishop moved to Lindisfarne and the church became the centre of a monastery. These buildings were destroyed by the Vikings in AD875 and little remains of this early church. St Wilfrid's crypt can still be seen below the church and the bishop's chair is still on display in the chancel. While this church eventually flourished, to be refounded by Augustinian monks in 1113, two other churches also existed nearby, and considerably less survives of these today. The Church of St Peter was built in the late seventh century and was probably also destroyed by the Vikings in AD875. Its precise location is now lost, but it is thought to have existed somewhere near the Market Place. The Church of St Mary was built sometime between AD705 and 709. It was separated from St Andrew's by a graveyard. It may have been a circular building but was rebuilt in the 13th century and some of its remains can still be found behind 11-13 Market Street, 14 Market Place and 15 Market Place. The Anglo-Saxon church had a boundary marked with a number of crosses. The site of these crosses can still be broadly identified today at Gallow's Bank, Maiden Cross and Union Workhouse, although in most cases the remains, where they exist, are much later. Wilfrid's church was rebuilt in 1189 by the Augustinians and a gatehouse added in the mid 12th century. 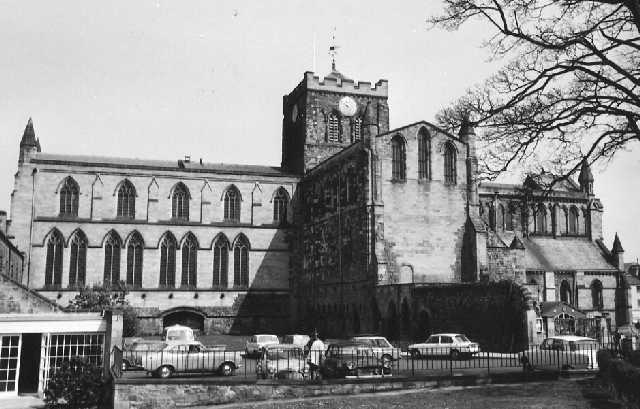 After the Dissolution of the Monasteries in 1536, the abbey became a parish church serving Hexham. Much of the building today is 19th century in date. However, inside the church a wealth of Anglo-Saxon stones can be seen, the most famous of which is that thought to be dedicated to Bishop Acca and dating to the mid eighth century. Inside the Priory, in 1832, a hoard of 8000 coins was found inside a bronze container. In 1841, more coins were found nearby. So the picture that is developing of Hexham from the seventh century is of a major ecclesiastical centre that continued through to medieval times. The most prominent medieval remains in the town are the Old Gaol and the Moot Hall. The Old Gaol was the first purpose built prison in Britain and dates to the mid 14th century. Many centuries later, in 1820, Hexham was equipped with a House of Correction that still retains its iron cell doors with their complex locks. The Moot Hall dates to the early 15th century and was probably built as a defence against the Scots. It was still acting as a defence against the Scots as late as 1640, but was later used as a courthouse. Many of the claustral buildings relating to the Priory Church are also of medieval date. A number of hospitals existed in the area and these were also religious foundations designed to serve, amongst others, poor pilgrims and lepers. Pilgrim's Hospital is now lost but existed in the 14th century. St Giles Hospital existed in 1114 and was abolished during the Dissolution and converted into a house. An Anglo-Saxon stone was found nearby suggesting the presence of an even earlier foundation here. The site is now a golf clubhouse and no visible evidence of the medieval hospital can be seen above ground. Hexham also had a school of very early date. Hexham Grammar School was founded in 1599, the building which we see today forming part of the complex of buildings at Hallbank House, dates from 1684. In addition to Hexham's ecclesiastical role, it had also grown into a medieval market town, and its growth was strongly influenced by this commercial function. The town served as a market for the surrounding agricultural area. Initially the market was for corn and market garden produce. The Market Place is still used and The Shambles, originally built for butchers in 1766, is also used. Agricultural improvements in the countryside led to the final decline of some villages which had existed since medieval times. They were subsequently replaced by a single farm, marking a more intensive agricultural use of the land. A number of farms were built from the 18th century, including Middle Shield House, Highwood Farm, Highside Farm and East Peterel Field Farm and gradually, as land was improved, it took on the characteristics which are still familiar today. The economic relationship between town and country remained close as the development of the leather industry in Hexham resulted in the production of livestock for skins and hides to be sold and processed in Hexham. The manufacture of goods from the processed skins and their sale allowed Hexham to grow significantly in population and flourish in the 17th and 18th centuries. A number of tannery sites have been located in Hexham in the Burn Lane area and High Shield. One of the more interesting buildings still to be found in Hexham relates to the rope making industry. The Ropery, located behind the former bus station, is a 100m-long building, but is only 4m to 5m wide. Built in 1800, it originally had no roof. The growth of Hexham continued into the early 19th century but the industrial development of Tyneside was soon to result in the decline of rural industries in Hexham. The advent of cheap rail transport allowed goods to be distributed more easily and cheaply and to push rural factories into decline. The railway station in Hexham and its associated buildings are mostly still in use. The growing population had to be housed and many of the buildings in Hexham today date from the 18th and 19th centuries, such as along Hencotes, Station Cottages, and Wentworth Place. In some cases, earlier medieval fabric has been reused to construct these more fashionable buildings, such as Prospect House. By the 19th century, the priory church was no longer the only place of worship. The growth of nonconformism, seen so often in the north and associated with the growth of industry, resulted in the construction of new chapels. Trinity Methodist Chapel was built in 1860 and some of the architectural detail deliberately mimicked Hexham Priory. Later, the Primitive Methodist Chapel was built in 1909 and is now used for shopping. The centre of the town was to become a pleasant green space for public recreation. Parks were created from the 18th century: the Sele was opened to the public in 1753, the Abbey Grounds were laid out as a public park in 1911 and Hexham House gardens were made public in 1928. These parks now provide the location for a bandstand and Hexham's War Memorial.